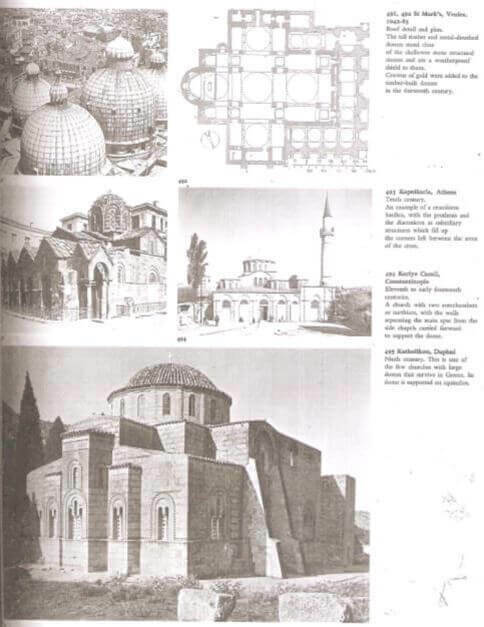 It has sometimes been said that Byzantine architecture is eclectic, in that it consists of a blend of various ideas that were developed previously and which came from East and West alike. This is no doubt true, but it is also true that all art of quality has always owed an immense debt to the past, and if Byzantine architects blended ideas from diverse sources to form the basis of their own style, they did so with genius and imagination and succeeded in achieving results of outstanding glory. If we set aside the various tentative efforts which have been noted so far, most of them more Roman or more Eastern than Byzantine, the story may begin with the series of buildings set up in the second quarter of the sixth century under the patronage of Justinian, more especially at Constantinople. They belong to various types, but all represent variations on a merging of the themes of basilica, cross and square roofed with a dome. Simplest and most straightforward is the group of which St Eirene at Constatntinople may be chosen as the type example. It consists virtually of an ingenious combination of the ideas of an apsed basilica and a domed square. The dome is set on massive built piers, between which are columns which serve to divide the aisles and support a gallery; they no longer support the side walls and roof as they did in the old basilicas, though the idea of the basilica is there on the ground. The resemblance is even more striking if we compare the interior with that of St. Demetrius at Salonica, where built piers already alternate with a series of columns, though they have no function other tha to strengthen the long aisles; columns were well enough in Rome but hardly sufficient secure in the East where the shock of earthquakes was from time to time experienced. In order to give greater length, and so approach more nearly to the conventional basilica, this plan was elaborated by the addition of further bays to the west, sometimes vaulted and sometimes domed; in the latter case a building consisting of two domed squares, one in front of the other, was produced. Similarly the central square was extended in other directions by the addition of a square at the east to form a choir and squares north and south to form transepts.